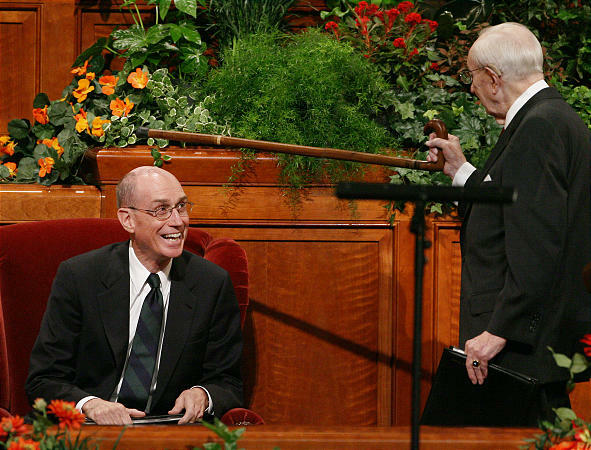 During the Saturday morning session of October 2007 General Conference, President Hinckley conducted the sustaining of church leaders. When he finished and returned to his seat the cameras zoomed out and those of us watching on TV or computers could not see what happened.� Instead, we saw President Hinckley pause before he sat down and we heard the laughter of the congregation. A few weeks later, my son emailed me this photo showing President Hinckley’s pause to “knight” President Eyring (if you click on the picture it will enlarge). It is one of my favorite photos of President Hinckley. I am going to miss him.